In Hungary, post-crisis growth has been driven solely by external demand. Investment and con-sumption are suffering on account of legal uncertainties and impaired financial intermediation. For 2011, nationalizing the assets of private pension funds will secure a one-off fiscal surplus. Interna-tional investors have demonstrated their appreciation of the government’s fiscal plans. 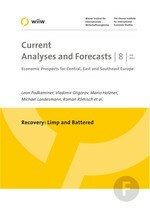 The slow export-based recovery is expected to continue in 2011.